FLINT – The Carman-Ainsworth volleyball team ended its season in the district championship, losing to Flushing 25-13, 25-11, 25-20 last Friday. The game was held at Carman-Ainsworth, after originally being scheduled to take place at Saginaw Heritage. Flushing advanced to the regional semifinals, where it faced Petoskey on Tuesday after deadlines. Areyana Harrison had a team-high four kills, followed by Destiny Johnson with three kills. Angel Eubanks added three aces and two blocks. Last Thursday, the Lady Cavaliers swept Swartz Creek 25-23, 25-20, 25-19 in the district semifinals. In the contest, Mary Dollinger posted 14 assists, 12 points, six digs and three aces. 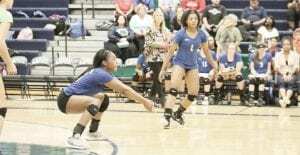 Aniya Harmon added 10 assists, eight digs, eight points and two aces. Diamond Lester had nine kills and seven digs, Eubanks contributed eight kills and two blocks and Johnson finished with five kills and two blocks. Sarah Roe added eight digs and six points. The Lady Cavs received a bye in the district’s opening round. Creek beat Saginaw Arthur Hill 3-1 in the opening round, while Flushing swept Heritage 3-0. Flushing also beat Kearsley 25-12, 25-10, 25-11 in the semifinal. Carman-Ainsworth finished the season with a 16-24-5 overall record.